Those who do not have green thumbs can bring nature and springlike touches inside with fanciful butterfly "trees." They are small enough to place almost anywhere in the home, such as on a fireplace mantel, the middle of a coffee table or even on a dining room table as a centerpiece. Use as many or as few card-stock colors and patterns as desired. When the butterfly tree serves as a centerpiece, consider the occasion. For example, punch butterfly shapes from pastel yellow, green, pink and/or blue card stock for baby shower or Easter decorations. Select blue and white for Hanukkah decor, red and white for Valentine's Day, and orange and brown for Thanksgiving. 1. Punch out 12 green butterflies and 12 patterned butterflies. Fold the butterflies gently in half, and open them so they look like they are halfway in flight. Place them in a bowl and set aside. 2. Gather the branches. 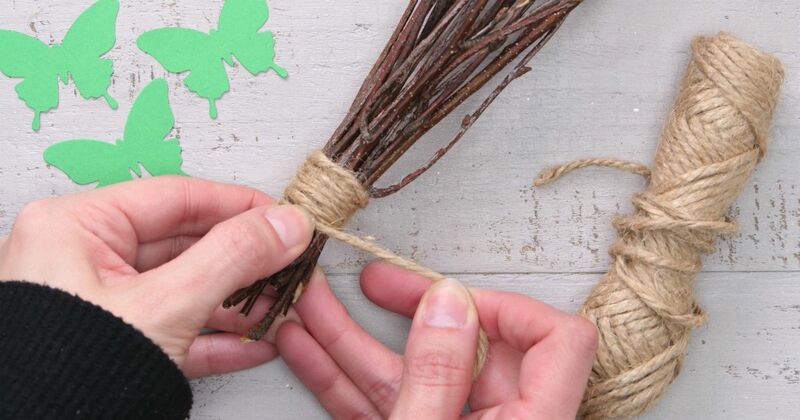 Tightly wrap twine around the branch bottoms and knot the twine. Tightly wrap the twine around the bottoms several times and tie it off with a knot. Cut off excess twine. 3. Place a small dab of hot glue in the middle of the body on the back side of a butterfly. Gently press it where you want it on a branch. Repeat this step for each butterfly and let the glue dry. 4. Place a large squirt of glue in the center of the wood block. Press the base of the gathered branches into the glue. Hold in place until the glue dries. 5. Run a thick line of glue around where the branches meet the wood. Press the dried moss or grass into the glue. 6. 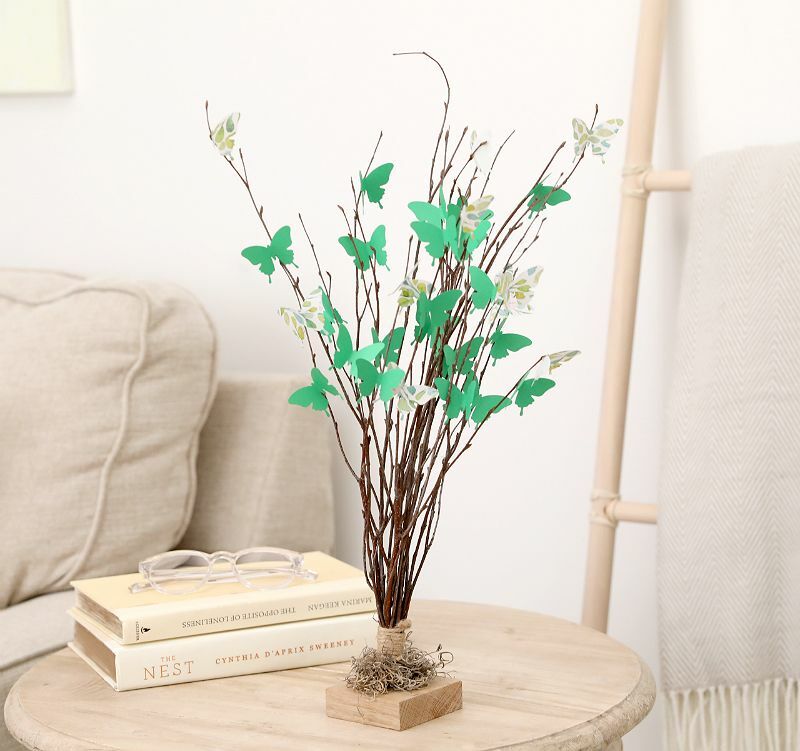 Place the butterfly tree on a table, mantle or shelf.